This coat of arms captures the spirit of the Franco-American alliance. Half of the shield is painted with the pattern of the American flag, while the fleur-de-lis (the symbol of the French king) is depicted on the other half of the shield. Nowhere was the victory at Saratoga more noted than in France, which had been tentative in its efforts to assist the Americans. France's interest in the American fight for independence stemmed from France's humiliating defeat during the Seven Years War at the hands of its ancient enemy, England. As French historian Henri Doniol has put it, "Almost immediately after the peace of 1763, it (the French Government) sought in the tendency of the English colonies to revolt against their mother country the occasion by which we would avenge ourselves upon England and tear up the treaty of Paris". As early as 1774, Vergennes, the French foreign minister, had sent secret emissaries to explore the American colonists' commitment to independence. In the spring of 1776, Congress dispatched Silas Deane to France as a secret commercial agent to see if he could make arrangements for the purchase of military supplies on terms of credit. Deane also made inquiries into possible French political and even military assistance. 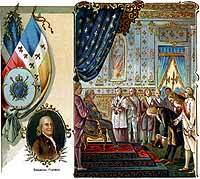 Thanks to Benjamin Franklin's excellent diplomatic skills, a treaty was quickly signed between France and the United States in 1777, as seen in this picture. The official attitude of the French government toward the American Revolution in 1776 and 1777 was essentially a recognition of belligerency. This was the case at the fall 1776 arrival of the Continental Congress's official diplomatic mission to Europe led by Benjamin Franklin. Watchful waiting by French diplomacy came to an end when the news of the surrender of Burgoyne's army at Saratoga reached Paris on December 4, 1777. The American victory caused a reversal of British policy toward the Americans. Lord North's government immediately prepared to send to the America a mission with an offer of peace on the basis of home rule within the Empire — something that the Colonies would have been only too glad to accept in 1775. The French and American armies weren't always on the best of terms. During the siege of Newport, Rhode Island, the French under the Comte d'Estaing were forced to seek shelter in Boston during a severe storm. The Americans were none to happy that the French abandoned their position. This diplomatic move became known to Vergennes, and he became alarmed that a peace between the parent country and the American rebels might be a real possibility. Two Franco-American treaties were rapidly concluded. The first was a treaty of amity and commerce, which bestowed most-favored nation trading privileges and also contained cooperative maritime provisions. The second was a treaty of "conditional and defensive alliance." It provided, among other things, that in case war should break out between France and Great Britain as a result of the first treaty, France and America should fight the war together, and neither would make a peace or truce with the enemy without the formal consent of the other. Nor would they "lay down their arms until the Independence of the united states shall have been formally or tacitly assured by the Treaty or Treaties that shall terminate the War." If War should break out betwan france and Great Britain, during the continuance of the present War betwan the United States and England, his Majesty and the said united States, shall make it a common cause, and aid each other mutually with their good Offices, their Counsels, and their forces, according to the exigence of Conjunctures as becomes good & faithful Allies. The essential and direct End of the present defensive alliance is to maintain effectually the liberty, Sovereignty, and independance absolute and unlimited of the said united States, as well in Matters of Gouvernement as of commerce. The Most Christian King renounces for ever the possession of the Islands of Bermudas as well as of any part of the continent of North america which before the treaty of Paris in 1763. or in virtue of that Treaty, were acknowledged to belong to the Crown of Great Britain, or to the united States heretofore called British Colonies, or which are at this Time or have lately been under the Power of The King and Crown of Great Britain. If his Most Christian Majesty shall think proper to attack any of the Islands situated in the Gulph of Mexico, or near that Gulph, which are at present under the Power of Great Britain, all the said Isles, in case of success, shall appertain to the Crown of france. In order to fix more precisely the sense and application of the preceding article, the Contracting Parties declare, that in case of rupture between france and England, the reciprocal Guarantee declared in the said article shall have its full force and effect the moment such War shall break out and if such rupture shall not take place, the mutual obligations of the said guarantee shall not commence, until the moment of the cessation of the present War between the united states and England shall have ascertained the Possessions. The American war continued, as France desired. France and Britain drifted into hostilities without a declaration of war when their fleets off Ushant off the northwest coast of France on June 17, 1778. A French expeditionary force arrived in the United States in 1780. As was demonstrated at the Battle of Yorktown, the French alliance was decisive for the cause of American independence. From the noble class and knightly order, Count Rochambeau was among the many French who fought on American soil. This small but pretty page looks at Rochambeau's involvement in America. France's help at Yorktown was essential to winning the war. Americanrevolution.org offers a scholarly look at the relationship between the French and Americans. With several chapters on topics ranging from battles to French balls, this site is a great resource for long-term history projects and research papers. The Marquis de Lafayette was a French nobleman and an ardent supporter of the American War for Independence. It through his diplomacy that the King of France decided to form an alliance with the colonists. The Xenophon Group presents several pages on Lafayette's military exploits in Virginia during the Revolutionary War. Plenty of maps on this website examine Lafayette's positions. The Kidport Reference Library offers a page on the French alliance. This brief but informative webpage also showcases a good picture of Franklin actually signing the Treaty of Alliance. Find out all about the events surrounding the Franco-American alliance. Why did Franklin wear his brown velvet suit? Why did the Americans need the French? America's Story from America's Library, a student website developed by the Library of Congress, provides several pages on the Americans' alliance with the French. Presented by ushistory.org, this short essay describes the essential role Benjamin Franklin played in gaining the support of the French royalty. Not only was the alliance an important turning point in the war, but making sure the French didn't control too much of American affairs after the war was also necessary. From revolution in America to revolution in France, the Marquis de Lafayette fought in many battles, suffered under the threat of the guillotine, and spent several years tortured in a miserable dungeon in Austria. While in France, Benjamin Franklin made sure the British would take note of the Franco-American alliance. Find out how.